Do I have one of those faces ! I have another post have drafted but wanted to post this quickly. . Was at the gym last night, and hadn't been for 4 days as I had family staying with me. Was tired and cranky (because TOM due tomorrow) and mother driving me mental (god love her, that is her job !!) and a trainer chatted to me. Now this is the 2nd one that has befriended me, is it because I am large? or just have one of those faces. She tried to convince me to go to the bodyjam class. What was good was I had 8 minutes chat to her about mine, and others, fear of classes -she said there is always someone else that feels that way. Apparently next week is some new routine etc and no one will know it I made promise to her that I would go. The thought terrifies me but I think it will be good for me and a change of routine. It is good to face our fears. WI tomorrow so with TOM due I am not feeling positive, probably because I am going mad with PMS symptoms, don't you just love being a girl. My niece arrives tomorrow to spend the weekend with me. Looking forward to it and will sit down and plan what I am eating (as we will be out eating a lot). She does need to lose weight but I want her to realise that being overweight does not define you as a person, you are after all more than a body. As a person that had a mother that hounded me about my weight, I don't want her to go through this, after all we all know that losing weight is about mindset - not what others want us to do, although I know I need to lost a lot of weight, saying that doesn't make it a natural thing to do, I am doing well because my headset is right, but if it wasn't then I would struggle . She is a fantastic 14 year old and I always reinforce that I love her for her. Well, as you know I set, or I should say my leader and I set a challenge about have 4 losses in a row. Once that is achieved then I can buy my vintage inspired Lorna Jane Gym Bag. So went to my weigh in at Myer and my WW and I had a great chat about balance, but more about that later. Got on the scales and had no idea how I was going to go as due to my obsession about organising the house I had done no exercise and there you go another 700 grams down. So pleased with that, half way through my challenge. The beauty of the one on one meetings through WW at the Myer Centres is it is about you. I talked about the gym, which I love and adore, and not for the weight loss benefits but for the stress relief it provides and how it makes me feel when I am finished. What I found was a although I went to the gym, the house suffered. As I said to Di (My Leader) I need to find a balance where I can go to work, socialise, go to the gym and keep on top of things as after all even when I get to goal, the journey is not finished and I need to maintain for life. So this week there was little exercise but more organisation at home. I had comments from other people that read my blog and both personally, we seem to all suffer from this at some point. But with my insomnia I need to be organised so now the house is semi okay I can go to the gym from work, have dinner and do a bit of house work like my plan to do one room a night and have the balance. Before I forget, those in Australia that read this and attend meetings. WW have changed the format, I think the new format isnt a success and so my leader has advised me, if people are not happy, it is critical that they complain. Remember everyone the power of the people. So please so yourself a favour and for all those other members out there and complain. We do forget that WW is a business after all but saying that they wont want people to leave the organisation. There was a survey after the meeting format was implemented and they have based it on that, but people being people they don't want to cause conflict for their leaders and thus conflicting views. I thought I would raise the topic of support today? I do get support from my leader, she is firm but understanding but what is absolutely mindblowing the support from the online community. Other than blogs which I am now finding quite a few newbies from new sites I visit but also from my little WW Facebook group, which is full of women of all different ages that support each other, at times we have nothing in common except our battle to lose the bulge. These women are at various stages of their journey and so there is always someone that can help. I really suggest getting people together from your meetings and either starting up a group, get on facebook and chat or whatever it takes as what I found that support from the online community is such a wonderful thing. This week I am back into the groove of exercise, I plan to implement my new organisational program of going to work and ideally getting off the tram early and walking into work, working, going to the gym after work, coming home and cooking a meal and sitting down and enjoying it and then a bit of speed cleaning each night -either one room a day or what I perceive needs to be done. Keep you posted. After all it is about Balance. Last night saw me attend an aunt's 70th birthday with mum and dad. This is one for you. My aunt is my dad's aunty but they are the same age. Basically my great grandmother and my grandmother had babies at the same time (one my aunt and one my dad). It was great to catch up with the Dally clan and we always have good fun. One of my cousins (2nd etc) Kate who happens to be born on the same day as me was the only one to have enough guts to ask me why I wasn't married, I told her simply it hasn't happened and I am hoping that good things come to those who wait but saying that, this year is not about just weight but also about opening up the universe to good things and becoming the master of your destiny. Australia Day we are having a catch up with friends, initally we were going to Hazelwood Park but have since decided to have it at a friends place, we are all bringing something and have a picnic style meal. I am making a WW Zucchini Slice and Rocket, Pear and Parmesan salad and know there will be chicken there, so I think I will be fine. I try not to drink during the week, although everyone will be sipping on the savignon blanc or Rose I will take my Perrier water and have that in my wine glass with lemon. Luckily, as much as I am foodie and wine buff I can say no to wine. So, over all things are quitely going well. I think we should all remember to run our own race, just because one person is losing massive numbers on the scales, it doesn't have to be a competition. So girls, run your own race, if it takes a little longer then so be it and enjoy the journey, if you enjoy it I think we will be able to get to goal and then start the new mindset and lifestyle associated with keeping us at our goal weights. New blogs coming this week.......one food, wine and entertaining associated and another is a magazine style blog where I will review and discuss everything (ie. the new brand of coffee out, current affairs or a discussion on how to raise confident children). Just trying to sort out catchy names. May have something like Miss Marty's guide to ...........etc. Any ideas most welcome. Today is Tuesday and I feel so so. Somehow trying to balance the gym, work, home and food today is a bit much but this mood is mainly though lack of sleep. I am currently having a clean out of stuff (like old disks, computer parts) and old Tupperware, what I am finding is that I need to be organised to achieve my weight loss goals. I think firstly doing up a menu planner for the week is one way, I have decided on the following for cleaning schedule for me to do after dinner and the gym to structure my time better :- Monday: Loungeroom Tuesday: Kitchen Wednesday: Toilet, Laundry and Bathroom Thursday: Main Bedroom Friday: Study and spare bedroom Weekend: Outside, cook meals for week, grocery shopping This way if I allocate a room to a day and do a thorough clean I might find it a bit easier so that on the weekends I am not running around like a headless chook. I adore the gym and the stress relief it brings me, the house has never been so disorganised and as the insomnia just worsens when this happens since the gym commenced although the gym is my absolute joy of my week (this is a minor miracle !!!) , I need to have a plan. So the rubbish guys came today for the bins, the bin is full and threw out a lot of stuff, boxed stuff I don't use and labelled it ,and somehow feeling better. Tonight I just have to do my room and the bathroom and 3 baskets of ironing (which I never have as I always iron every Sunday night) and then I should be back on top of things. The Virgo in me has high expectations of myself, sometimes I have to realise with 3 hours sleep I can't conquer the world ! My parents arrive on Thursday and so I will get my darling Dad will do some jobs at home which is a bonus. Ate a bag of lollies yesterday, so that put my evening meal out of wack, but saying that these things happen, I think it is unrealistic to think that I can be 100% good 100% of the time but things are going well with WW and I am pleased with my headset and the focus I need. I suppose my little mood is more men related, it would be nice to have romance in one's life but saying that I have a good life, great job and wonderful and adored family and friends. Tomorrow I am hoping to get back to my normal routine, that way I will feel a bit better and more in control. Next week I have a few nights out with the dinners so I am going to sit down and plan what I am eating and I am at least lucky that my friends are supportive and I can be honest with them. I suppose the excellent thing about the lolly situation yesterday is that I got back on the horse, normally it would be an excuse to eat. The online support I get is remarkable, I have a facebook group I am involved with and all doing WW, we are meeting up in Melbourne in May 2010 so I am seriously planning to attend. I find them inspirational women but what is remarkable is that we are all strangers but somehow friends. So the cap it off, this week I am organising home a bit better (to allow me to sleep) so that I can relax when I go to bed after the gym etc, that way my brain is not in overdrive. I hope everyone that is trying to get healthy, exercise more and lose weight are doing well, I know that with persistence and support there is nothing stopping me. I am pleased to say that I am fairly relaxed about this, I think sometimes we need to breathe and slow down a bit and enjoy the journey instead of trying to be wonder women ! It is 3.30am on Wednesday morning and I cannot sleep, the story of my life so I thought I would give everyone an update. The cool change has hit Adelaide which is a such a relief and lots of rain, hopefully it will help green up my lawn. Tuesday saw another good day as far as food, water, tracking and exercising goes - when friends struggle and they are chatting to me, my advice is always babysteps and to just focus on 1 day at a time, after a few days you are back in the groove of doing the right things. So far after my weigh in on Friday it has seen the days from Saturday to Tuesday (so far) as being perfect and I am pleased that the mojo which obviously went on holidays somewhere exotic has returned to me. I am trying to vary my food intake around as a bit of advice from a WW leader a while ago who managed to lose 75 kgs told me to never have the same foods 2 days in a row and as I have been advised by the gym that your body gets used to the routine of exercise if you do the same thing, I am trying to vary the food, try new foods and recipes. I brought late last year an A4 size 2010 diary - at night I print off my WW online tracker and write down my food, water and exercise and any notes I have, it will be interesting to see how this goes and my notes etc during the year. Went to the gym last night, during the week it is easy. Nothing else much gets done around home on these nights other than dinner, the dishes and a bit of TV but I am sure that as the exercise levels improve as will my energy levels. Did my cardio program last night, as a rule normally I don't sweat much if at all, but when I do my designed cardio program I am dripping and my hair is quite damp. This is a good feeling as I know I am working hard. Adrian the manager of the personal trainers at my gym initally designed my program but I have become friendly with one of the younger trainers Jess who is such so wonderful that I actually emailed her boss, she was the trainer that spoke to me on my first solo day at the gym and has been in my corner ever since and considering I am a stranger. I talked to her about my program and how often I need to re-design it etc, she is going to see me every 6 weeks for a new program and 3 x 1/2 PT sessions, her rates are cheaper than some but I will need to cut back in other areas so I can do this. She redesigned the cardio and I am doing more intensity and 15 minutes more, I am a little nervous about the prospect of this but I am sure that with self talk I can push through the pain barrier. Last night I was exhausted by the end but did the program (old program) at the levels designed even though it was tough - that in itself is a sign that things are going great. So in 6 weeks I see the lovely Jess again and I am sure she will help lift my fitness level, we have talked about classes which is a terrifying thought but that will come. The gym is busy with new members but what is absolutely bloody brilliant is that it is all sizes, last night I wasn't the largest member and there are lots of ages, sizes and fitness levels and it is good that this gym is about average people and not the beautiful ones. Overall, I am very pleased with how I am going, yesterday my boss brought in some Haighs chocolate truffles (for those not familiar with these, they are the most divine thing god put on this earth), I turned them down and had my diet yoghurt and was happy with that. Isn't doing something like this a good feeling ? It does mean the mojo is back from vacation. So far this has been a positive week, but in reality 1 week out of 52 weeks in the 2010 year - I need to ensure that my intial goal/challenge of 4 losses which is 1 month of good work is kept up. As my reward for 4 losses in a row I am going to buy a new gym back - either Lorna Jane and ditch the back pack - I like things to look nice even if it is carrying stuff to the gym. Anyway, off to bed again - Vince the wonderdog is fast asleep and I am about to wake him for a cuddle as he is just so damn cute. Well all I can say it is hot !!! Adelaide is undergoing a heatwave at present, not fun. We have had a lot of days over 40 degrees, it is shocking ! Hopefully the cool change will come tomorrow, the positive of this is that the water intake is high ! Well, Day 3 since my weigh in on Friday and all going good. It is funny how when my leader was gentle but tough with me about me joining previously and it was now time for me to make 2010 my year. I was a bit embarrassed (that is my personality type) but what I needed. I am just focused on doing the tracking my food within my points, water and exercise. I note when I go to the gym that I am sweating profusely when I do my cardio and know that I am pushing myself, I am hoping that within the next few weeks I can increase the intensity a bit. The gym was busy tonight, it will be interesting to see by June how many newbies are still there, I am just pleased I joined when it opened and have been there since the start. Today's evening meal was an omlette as after the gym I am never really hungry but will go tomorrow for a 30 minute workout, it is the feeling you get when you finished that I like. I do feel self conscious a bit, I note some girls with great bodies and how far they push themselves, it made me realise today that exercise is just part of their lives and how they keep trim. Overall, all going well. I am quite calm about this process, I think sometimes we get too carried away with it all, exercise and good eating habits have to be the norm and not something that you do to lose weight, it should be like cleaning your teeth - it is something you should do. Well everyone, I am hoping the scales are kind this week, a good weight loss is what I need. With the increased exercise, I may need to tackle the balance of points and bonus points but at least there are a few people I know that are a bit experienced in this area (Tania and Kazz !!). With a weight loss on Friday that makes 1 loss out of 4 so far. My goal was 4 losses in a row so I am hoping with a loss this Friday it makes me a quarter of the way to my goal. I must decide what to buy, I may buy an iphone device of some description. After all the planning of Christmas, it has been and gone. I need to start from my last post of 22/12/09. 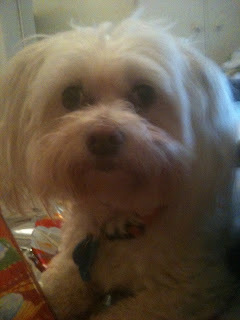 This is a photo taken of the world's best dog, my surrogate child Vince or formally known as Vincenzo Christopher Dally. If I had $10 for every cuddle this little guy got I would be rich. 23/12/09 saw my last day at work for the year. My lovely boss gave me a Chanel No 5 gift pack of bath foam and perfume, I was ecstatic as I adore that perfume but could never afford it, it nice to know I am appreciated and will use the perfume for special occasions. We finished work at 12pm and took a taxi down to Glenelg (a beachside suburb of Adelaide) and had our Christmas lunch with another solicitor at Sammy's at Holdfast Shores, we started off with some drinks and dips, and then had a fresh seafood platter with octopus, oysters, prawns and lobster and it was divine and very point friendly and had some lovely Sauvignon Blanc wine from New Zealand and finished up with coffee and a Cointreau drink on ice ( !). 24/12/09 saw me drive to Broken Hill for Christmas. I did pick up a friend of my mother's son and drove him up, Vince the wonderdog sat on the back seat and glared at me for 6.5 hours. My mother cooked for Christmas like she was feeding a third world country, I had decided to enjoy the day with my family and get back on track. Broken Hill had a gastro epidemic and as a consequence 7 family members, including myself got sick, so Mum's Christmas lunch did not happen, we didn't end up eating till days later and at that stage we all felt a little sick still so a lot of the food went to waste, I stayed up at Broken Hill until 30/12/09 and drove home on 31/12/09. I had New Years Eve with a friend Michael and was going to have the "talk" about commitment and us but chickened out. With my lung condition, one of the symptoms is lethargy, I suffered greatly from that in that I was tired a lot, the lack of vegetables in my diet over the Christmas period didn't help. Before Christmas my leader asked me to think about what I want to achieve in 2010. I suppose I have set myself some REALISTIC goals in relation to the gym, it is my wish that by 31/12/10 that I am fitter and the gym is a sanctuary for me to go and unwind and a tool to enable the weight to come off, I suppose Kazz is an inspiration for a newbie at the gym to look at what she has achieved and learn from that, I suppose I would like to purchase a heart rate monitor as well to keep me focused on goals etc. Another resolution of types is to be in double figures by 31/12/10 which is 17 kilos and absolutely achievable, it is not use setting goals or resolutions that are not achievable. I went back to work on 7/1/10 and to be honest glad to get back into the routine, I did not track once since my last weigh in and there were a few days that I ate too much and over ate, that needs to be addressed. The binge eating is a problem that needs to be addressed. Went to my WI last night and gained 1kg so pleased with that actually, considering I didn't track. What was good was that my leader is honest and to the point, one of the positive things about the one on one approach and WW's Lifestyle Centres, with mine being in Rundle Mall, Adelaide. She advised me I had been to WW before - true and that this was the year I needed to get serious. She asked me before Christmas to think of what I wanted to achieve this year, I did think and the world CONSISTENCY was what I want to achieve, consistent losses, 500 grams a week would make me happy. After much discussion, we set a goal for me to aim for -4 losses in a row and need to work out what I am going to buy myself once that is achieved. I woke today knowing there is now no excuses, I can stay 117 kgs or 71 kgs it depends on what I want, I think I just need to focus and do the self talk. It is unfortunate that my leader resigned, I was in a good spot with consistent losses but that is now done and it is no use me dwelling on that, what I want to achieve is 4 losses in a row from today. No excuses. I have a wonderful wonderful group of girls that are a WW support group via facebook, some of them are total strangers but we support and encourage each other and more importantly we don't judge. This little group does make me realise I am not a lone soldier in this weight loss battle, it is universal. My biggest problem is that I am too hard on myself, partly my personality type, partly mother issues (which I need to address) re my weight. Baby Steps is what I must remember. I am preparing a collage of things, like photos, a pair of long winter boots (I cant get them over my calves), food, my gym etc I am a going to use my friends, internet friends and anything I can obtain to help me make this year a year of weight loss. I have a new iphone and am trying to put on audio books and some podcasts, if anyone listens to any good podcasts, please let me know as I want to listen to some whilst at the gym.